We love this handy all stainless steel drinktop that turns your glass mason jar into a water bottle..... the Stainless Steel EcoJarz Drink Top — is designed to make reuse the new norm. 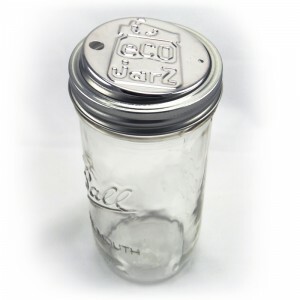 Because these drink tops fit standard canning jars, they also fit hundreds of other bottles and containers that are disposed of everyday.This drink top will fit any standard mouth jar, whether it’s an empty tomato sauce, salsa, or mayonnaise jar. 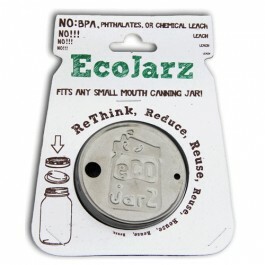 With EcoJarz, the possibilities of turning jars into long-lasting, always-handy, on-the-go drink vessels are almost endless. There is a growing amount of research highlighting the benefits of using non-reactive drink and food storage for everyday use. By using materials such as Glass, Ceramic, Stainless Steel and Silicone you are protecting yourself from many harmful compounds and toxins such as Bisphenol A (BPA) and Phthalates. Materials such as Glass, Silicone and Stainless Steel are best suited for contact with food and beverages because of their lack of reactivity. This means that you can use and reuse them again and again and they will put nothing harmful into your food!